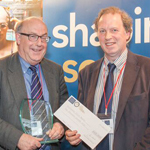 Professor Richard Harrison, Professor of Entrepreneurship and Innovation, University of Edinburgh Business School and Professor Colin Mason, Professor of Entrepreneurship, Adam Smith Business School, University of Glasgow – winners of the ESRC Celebrating Impact Prize for Outstanding Impact in Business. One of the key features of the development of a more entrepreneurial economy in the UK over the past 25 years has been the emergence of the business angel investment community as a major source of funding for new and growing ventures. Business angels are typically wealthy individuals who invest their personal capital in small businesses (typically start-up or early stage) in return for an equity stake. Indeed, business angels contribute more finance to entrepreneurial ventures than the institutional venture capital market. The award of the ESRC Celebrating Impact Prize 2015 for Outstanding Impact in Business recognises that the development of this market owes much to our initial and continuing research on business angels. However, the impact of research, as our experience of researching the business angel market in the UK demonstrates, is neither immediate nor predictable. Our initial research was funded under the ESRC Small Business Initiative in the early 1990s. Prior to this there had been a small number of research studies in the late 1980s in the US, on investments by private individuals in start-up and early-stage business ventures. These studies informed our initial research which was the first such study outside North America and introduced the term ‘business angel’ into the policy and practice lexicon in the UK, and subsequently more widely in Europe. This and our subsequent research has defined the policy landscape which stimulates and supports the business angel market. In the absence of this programme of research and policy involvement it is likely that the business angel market in the UK would have developed more slowly and in different ways. Instead, the UK is widely recognised by OECD, World Bank and others to be the most developed business angel market in Europe and from an early stage UK experience has been regularly drawn on, for example, by the Angel Capital Alliance in the US. We believe this programme of research is an exemplar of academically robust, practically relevant and policy influencing research which has made a substantive and sustained impact over a 25 year period, not just through the initial research but as a result of ongoing engaged research and scholarship designed, developed and delivered through close engagement with the policy and practitioner communities. Based on our own experiences over 25 years of working on this programme of research we have concluded that impact does not just happen, but is a function of a number of circumstances. Effective media management has been absolutely key to our work. From the outset we worked closely with journalists and commentators on national papers, notably the Financial Times and Guardian, to raise the profile of business angels as a key element in the entrepreneurial ecosystem. This, in turn, raised our profile, creating a virtuous circle in which we were then invited to engage in a variety of roles with the policy and practice communities, including speaking, writing and serving on working groups. In addition, we engaged with both the policy community and the communities of practice – notably the business angel networks and trade associations, meaning that we had direct access to key decision makers and our research results were available to them from an early stage. Finally, serendipity plays a role: important, impactful and enjoyable as it has been, this research programme may not have developed in the manner that it did had it not been for a conversation about a Marks & Spencer sports jacket (Colin’s) in an elevator at the Calgary Olympics site in 1988, venue of the 1988 Babson Entrepreneurship Research Conference, which introduced us to Professor Bill Wetzel (University of New Hampshire), then the leading researcher in the US on business angels. From small sartorial acorns mighty research programmes sometimes grow! Enter your email address to follow the ESRC blog and receive notifications of new posts by email. The views expressed on this blog are those of the authors and not necessarily those of the ESRC. All comments will be moderated before they are published.